Are They Close By? Will They be Back? Finding elk sign lets you know elk were in the area. But, if they were still there, you’d be looking at the elk instead of the sign, right? Of course, they could be looking at you from a bed or be feeding or bedded down just out of sight. Fresh elk sign may mean you should pick up your eyes, ears and nose and be prepared. In archery, it may mean you should nock and arrow and make a few cow calls. 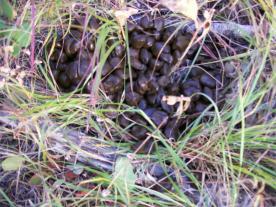 The third week of the Montana archery season this year (2008), I found very fresh bull droppings. I was tired from walking and seeing or hearing nothing all morning. I made an estrous cow call and waited a few minutes, then started walking. I immediately met eye to eye with the bull that had left the droppings. Too late, I was being negative and not prepared for his silent arrival. Successful elk hunts result when hunters stay alert and always expect to see elk! When he was sixteen, my son and I were hunting early on the last day of rifle season. He had a cold and was not really into the early morning trek. We were looking for fresh elk sign in six or eight inches of snow in a place where I have killed several elk. The snow was fresh, so any elk sign would be fresh also. I like fresh snow in an area that I already know holds elk. It’s like a recently erased chalk board. Everything written on it is new and up to date. After a long, arduous climb in the dark we found fresh elk sign in the form of tracks. The two sets of elk tracks were ambling along from side to side, back and forth. They were slowly feeding as they moved deliberately down the shaded side of the valley. There they would find thicker timber to bed down for the day. Along with the tracks more elk sign appeared here and there. The fresh droppings were still moist and warm. How do I know? I picked some up and felt them with my bare hands. If the poop leaves a stain on your fingers, it’s fresh! A fresh pellet will also often stick to your finger with just a little pressure. If you hunt with a partner, you can always wipe your hands on his shoulder. He shouldn’t mind. After all, you touched it to give him a freshness report. 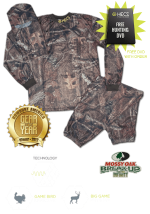 Besides, you’re also providing scent cover for him since the elk are close! 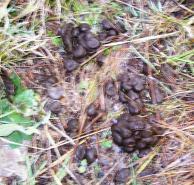 Elk droppings are bigger and longer than deer droppings. Moose are larger yet. If the droppings are dry and cracked, they were not left recently. If they still shine from moisture and each one spreads like grainy peanut butter or room temperature chocolate chips when you slide your boot across them, it could have been minutes, or an hour or two, depending on the weather. If they are still steaming in the cold morning air, they’re close by! Bulls will often, but not always leave their droppings in one neat pile. Cow elk often spread them a little wider and while walking. If it is well below freezing and ice has formed underneath the bottom most pellets, or the clump is frozen together, that lets you know it has been a while since they were dropped. On the same cold morning, loose, moist pellets are fresh. On the fresh snow that morning we also saw fresh urine. The urine indicated it was a cow. The spray was spread out and hit the ground in a “girl splash” instead of a “boy stream”. The other set of tracks were smaller. We had a cow and a calf just ahead of us somewhere. To verify the female status of the elk we were following, it helped to notice that both ends of the elk droppings had a point on it. A bull elk pellet will usually be pointed on one end and dimpled on the other. These are not fast set rules, but true more often than not. When elk have spent considerable time feeding on tender green stuff in a wet area, their poop will be ploppy, more like cattle pies, but smaller with circular flat disks. 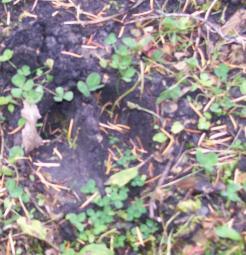 Cow or Bull Elk Track? A mature bull elk track is larger, four inches or more, than a cow or young bull track. They are broader in relation to the length of the track than a cow’s track. Cow elk tracks are more slender and pointed than a big bull’s. The track in the picture to the right is probably a cow elk track. You can see that it was walking through clover, a nutrient rich elk food. The cow elk tracks in the snow to the right were minutes fresh and made at about 20 degrees in thin snow. 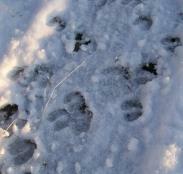 The next photo is of tracks made seconds earlier by a spike bull (I watched him make them, then snapped a photo). There are actually four tracks in the photo. Elk nearly or completely step in their front tracks with their back hooves when walking slowly. This spike's track pattern, with the left rear hoof track not quite on the left front track and the right rear almost exactly in the right front, repeated itself with each step. I watched a big bull elk make tracks a few minutes later but, sorry, I suddenly became too busy to take pictures! It can be tough to differentiate elk sign from young cattle tracks sometimes, once they get mixed up on the same trail. A young cattle track might be the same size as an elk's, but the tips of cattle tracks are more rounded. Mature cattle make much larger tracks than an elk. When looking at elk sign at your feet, the direction of travel could change in any direction. You usually can’t see where the elk sign proceeds, except just ahead of you. Try to guess where they will head to bed down. It helps tremendously if you have patterned them there before. In the morning, the eventual bedding destination is probably thick timber near a small water source and small patches of grassy meadows or flat grassy "benches". However, they like to meander and snack on the way from night time feeding areas to noon bedding areas. Click here for more about elk habits and patterns. When following very fresh elk sign, look up from the tracks often to give yourself a chance of seeing the elk before they see or hear you. Use your binoculars to look for elk body parts (ears, antlers, legs, belly, back) in the brush and tress ahead. Of course, proceed as quietly as possible. If it’s archery season, it may be preferable to start still hunting and do some calling. The elk sign we were following that morning had been made only minutes before. The tracks were headed downhill into some thick cover. My son was losing interest, because following them meant we would have to climb back up the steep mountain, plus back down the mile and a half deep-snow hike we had just taken, possibly with an elk carcass in tow. He followed the fresh elk sign dutifully with me until the tracks proceeded across the drainage at the bottom and appeared to be headed up the other side. The drainage had curved to the north. The other side was now the thickest side and that’s where the elk were headed. He balked at continuing and reminded me that he had a cold. The effort of carrying only his cow permit back to the truck seemed a better choice to him about then. As we stepped on elk sign made only minutes before, I told him we would take a less steep route back to the truck, along the westward curving side hill. Of course, I knew we could see the small patches of meadows above the creek on the other side from there. We left the elk sign and I told him to keep his eyes peeled across the drainage. Sure enough, the cow and calf could soon be seen feeding on the hill about 200 yards away. After I promised to get the elk home without him, if necessary, he dropped the cow for his first elk kill. Elk sign doesn’t always lead to elk. Studying sign is most often more informational and educational for us than immediately finding elk. Take notes, mark maps, date them and review them often as you add new data to an area. You’ll begin to see patterns. When you smell elk it may not necessarily mean that they are still near. However, much of the time this pungent elk sign means they are probably up wind from you. Use your wind checker powder to determine where the smell is coming from. You will get to know elk smell best by field dressing an elk. You’ll never forget the specific odor. If you occasionally use the spray bottles of Elk Fire Sexual Attractor, or other cow-in-estrous urine, you’ll be able pick out that smell, too. 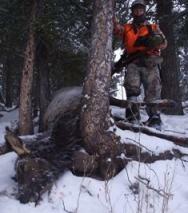 Estrous urine is best used when you’re pinned down and can’t get downwind of elk. It might help cover your scent, when you can’t move without being seen. It can also be placed in such a way as to help you get a shot when calling in a bull, but you often don’t have time for that. This would be a good time to set off and Elk Bomb. Wallows are great elk sign that means the bulls use the area to drink and feed. The problem with wallows is that it is impossible to predict when they will “wallow” in it. They could do it at anytime, night or day. Hunting in a tree stand over a wallow would be a lesson in patience that may not pay off. Wallows are used by bulls to leave their smell for the next guy or gal, to increase their own masculine fragrance (they often pee in wallows and roll around in it), or simply to cool off on a hot day. One frequently used wallow that we hunt often brings bulls to a cow call during the rut. Most others do not produce the same frequent results for us. Wallows are hit or miss. They are however, good elk sign to add to the list of evidence. Wallows can show up in unexpected places as a result of springs on a side hill, or predictably next to a creek. Many rubs are made before the archery season even starts, soon after velvety antlers are fully formed. They are then made as a show of strength to scare other bulls away from a herd of cows the bull would like to keep as his harem. at this time, the rubs often result in destroyed pine saplings. Elk rubs are excellent elk sign to take note of. A fresh rub will still look shiny with sap running down and some elk hair will be stuck to it. The bark scrapings will be on top of all the stuff on the ground beneath the tree. The bark scrapings will still have a fresh color if it was done recently. You can tell the difference between a deer rub and an elk rub. 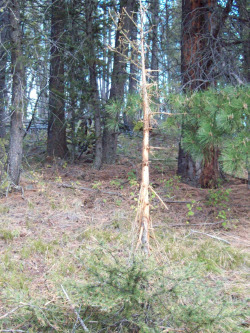 The elk rub will often be as high as six feet or more off the ground, extending down several feet toward the ground. Elk rubs indicate a much more violent effort. Trees that are "rubbed" are usually about the diameter of your ankle, upper arm, or larger. Sometimes the tree does not survive the brutal pruning job. A scrape is where the bull drags his hooves on the ground and pees in it. He does this in an attempt to communicate, “I’m here and I matter!”, to other elk. 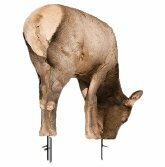 The hoof dragging is done with front legs at an outward angle away from the front of the elk. Scrapes are hard to find. They are often made near bedding areas. Elk Beds, Recent Elk Sign? Another elk sign that could be recently made is flattened grass or depression in the snow where the elk laid down. Elk beds are larger than deer beds, but smaller than cattle beds. There will often be elk droppings near are in the bed. A lone bed often indicates “a bull slept here”. A bull will often stand and pee right inside the edge of the depression. Cows seem to more often hit the edges or outside of the depression. Elk most often bed in open meadows at night, resting to chew their cuds awhile, and are found in heavy timber for day beds. Although less pressured elk might bed in a more open area. Audible bugles and cow talk is not elk sign, it’s proof! You’re close. Cow talk is not that loud. If you hear it, you’re extremely close. There is no doubt when you’re very close to a bugling bull, but a distant bugle is not usually as far away as it sounds.